I’m not so sure about how great Seren’s thinking is here, but at least she’s trying? It’s an improvement over just leaving them behind to die, if nothing else. The good news is that they got back to that forest and away from all the madness and now everything is going to be perfectly fine. Nothing else will go wrong at all. Best to ignore just how wrong things have just gone, though. Speaking of things not going wrong! 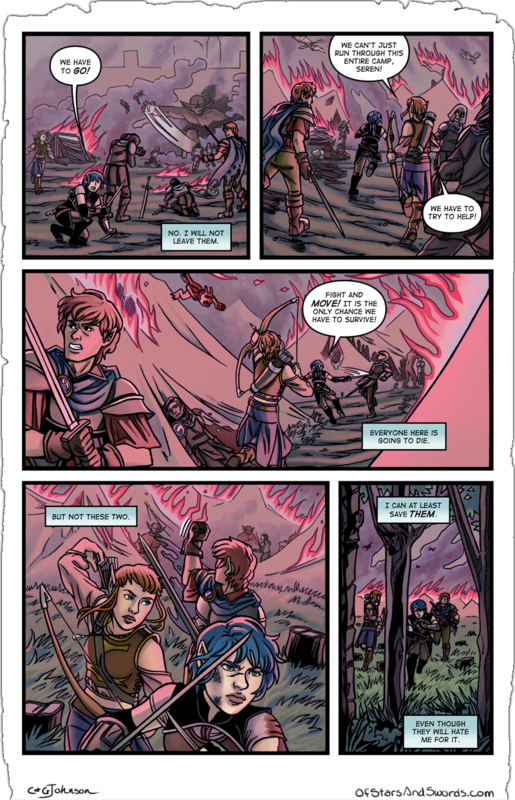 Of Stars and Swords Issue #2 is now available on Comixology, along with Issues #0 and #1! So if you’d like to read our comics in a form optimized for phone and tablet viewing, it exists! And as always, if you’d prefer to have a DRM-free version, we’ve got those in our store, as well as Issue #3 which is not yet on Comixology! Also in our store is our free scifi short comic, The End! Speaking of all these OSAS Issues, there are now 7 pages left in Issue 4! And after that, our first story arc will end in Issue 5! We’re in the home stretch!